We will go to my sister’s home to celebrate Thanksgiving with my family this Thursday. I love Thanksgiving leftovers but since I don’t make the dinner, I don’t have leftovers. 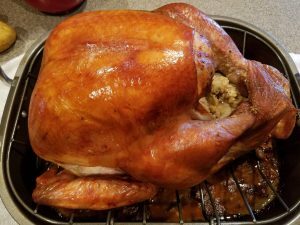 Hence, I buy a turkey and bake it the day after Thanksgiving. And I buy a large one, because remember, I said I love leftovers. So this year I was thrilled to get my turkey for 87¢ a pound. That’s a great price for Oklahoma but I saw a friend of mine in Virginia got one for 27¢ a pound! Wow!!! Oh well, I’m still thrilled with my deal. I thought I’d share my menu plan for using some of those plannedovers. Another night we will have another E meal (that’s one low in fat with some moderate healthy carbs) of the sliced turkey breast, sweet potatoes, rolls, and we’ll probably add in a salad. Then we’l have a healthy fats meal of Creamed Turkey, fried green beans, and some caulitaters. There may be some kind of “noodles” thrown in for good measure. We will have turkey sandwiches for lunch after church Sunday and round out our menu with Turkey Soup complete with daikon radish, carrots, and some kind of “noodle”. We’ll round out our week with this nice Italian Style Hamburger Helper with either some roasted green beans or roasted okra and a salad. So there you have my after Thanksgiving menu. Of course, you’d need to add one more meal in there if you actually have your main turkey meal on Thanksgiving. One of the things I have done in the past was to make turkey nachos but that would take some thinking to keep it from being a crossover because the way I used to make it was with tortilla chips (or nacho flavored ones), turkey, refried beans, cheese, lettuce, and tomato. If breast is used, you could use baked Tostitos chips, and go very light on the cheese, all the rest would work. If I wanted to make it a healthy fats (S) meal, I’d use the dark meat too, skip the beans and I’d have to use pork rinds or Joseph’s Lavash or Pita cut pre-crisped into chips. With this version I could add some avocado. Well, that’s it, our turkey menu. I hope you have a great Thanksgiving!